Ever since North Carolina lawmakers and Governor Pat McCrory rammed through North Carolina’s new all-purpose discrimination law (HB2) in just a handful of hours on March 23, there has been widespread speculation about the motives and role in the whole affair of North Carolina’s largest business lobby group, the NC Chamber. The fact that the new law (which was supposedly about responding to the city of Charlotte’s nondiscrimination ordinance) ended up including out-of-nowhere provisions that repealed the 30-year-old right of North Carolinians to bring employment discrimination lawsuits in state court, along with a ban on local living wage laws, was widely seen as an indication that the Chamber had quietly struck a deal with lawmakers. The group’s conspicuous silence in the intervening weeks only added fuel to the fire. “The group’s silence raises questions about what’s driving it. Is the Chamber’s apparent acquiescence on the anti-LGBT provisions the price it pays for other elements that it’s more passionate about? HB 2 blocked cities from passing minimum-wage laws, a feature the Chamber surely endorses. And it banned employees from filing a state cause of action if they think they were fired due to their race, age, gender or other protected classes in violation of anti-discrimination laws. Or does the Chamber remain on the sidelines because it more generally doesn’t want to cross a legislative leadership that enacts deep corporate tax cuts, reduces unemployment benefits and passes other business-friendly measures? Yesterday, the Chamber finally broke its silence and, rather amazingly, essentially confirmed the speculation about its cynical motives. 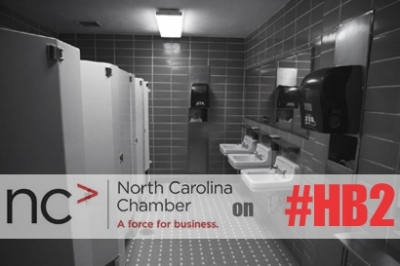 In a letter to its members and in an interview that the group’s boss, Lew Ebert, sat down for with Time Warner Cable reporter Tim Boyum, the Chamber made clear that it doesn’t think the law will be repealed and that it strongly supports and very much wants to preserve the new HB2 limitation on employment discrimination suits. This is a provision, of course, that is completely unrelated to the Charlotte ordinance and that even McCrory has specifically called on lawmakers to repeal. “the North Carolina Chamber…recommends the North Carolina General Assembly…[p]rovide that claims for recovery of damages resulting from employment discrimination may be brought in the North Carolina courts. The claimant must first file with the N.C. Department of Labor a charge of discrimination within 180 days from the day the discrimination took place and the NC DOL must issue a Notice of Right to Sue…. This is all, of course, utter nonsense. Under state law prior to HB2, workers who were discriminated against by their employers had three years to bring a lawsuit in state court. Under the proposal floated yesterday by Ebert, they would have only 180 days to act. Then, assuming Berry somehow deigns to allow a worker to sue, he or she must then head to the state Business Court – a venue designed and constructed for the benefit of the state’s business community. If you cup your ear, you can almost hear Ebert and his staff chuckling as they listen to people respond to this convoluted scheme they cooked up. It’s a wonder they didn’t add another provision that required lawyers representing harmed employees to pat their own heads and rub their stomachs while standing on one leg as they argued their cases. If the North Carolina Chamber wanted to have a debate about employment discrimination and North Carolina’s three-decades-old right to sue that was summarily repealed by HB2, then there was a way to do it and it didn’t involve a deceptive and mislabeled special legislative session. What’s more, to go silently along with the repeal for nearly two months and then, out of the blue, propose a new regimen for such suits that provides workers with little more than an illusion of a remedy is the height of cynical opportunism. “Even aside from this being a ruthless policy change, there was no urgency to do it in the one-day special session. It easily could have waited – and received genuine debate – in a regular session. Such an assessment is even more on-the-money today. Simply put, the scheme floated in Ebert’s letter yesterday is a joke and an insult to the intelligence of North Carolinians. It does almost nothing, as a practical matter, to restore the right of North Carolinians to seek redress in the justice system their tax dollars fund when they are fired or otherwise discriminated against by an employer for reasons that violate our laws. And in so doing, it confirms what most observers had long suspected about the Chamber and its role in the HB2 debacle. And that truth is this: Unlike in other states where state chambers and business groups have stood up to resist efforts to promote discrimination as “bad for business,” here the state chamber is an active accessory to the crime. Rather than standing for modernity, inclusion and progress, the North Carolina Chamber stands shoulder to shoulder with the haters, excluders and theocrats who would take us back to a bygone era. In short, the Chamber may have succeeded thus far in staying removed from the HB2 fray by remaining publicly silent, but as of yesterday, all that is changed. The group is in it now, up to its neck, and the bet here is that Ebert and his team will ultimately regret having picked the wrong side in this fundamental battle over the future of North Carolina. Previous article Why is NC letting a handful of multimillionaires get away this?